The Global CCS Institute is supporting the CarbonNet Project through the development of a series of knowledge share reports. The CarbonNet Project has completed its feasibility phase investigating the development of a hub-based network that will centre on a large capacity pipeline transporting CO2 to secure subsurface offshore storage sites, in Victoria, Australia. The Project's storage sites, for which permits have been obtained, have the capacity to store up to 5 million tonnes pa over 25 years in the nearshore shallow marine environment of the Gippsland Basin. The measurement, monitoring, and verification (MMV) of the CO2 plume will be a standard procedure during the operation of any CCS project. Before monitoring of the plume commences, the natural environment prior to injection must be understood. Often this is achieved through baseline monitoring and requires the validation of techniques for the particular context. Baseline monitoring predominantly will focus on establishing what the conditions are like in the storage complex prior to injection. But the monitoring can also extend to measuring the natural variability of CO2 on the surface and near-surface around the storage site and recording the background geological conditions (eg. seismicity). Given the long time frames and normal variation in environmental and operating conditions during the lifespan of a CCS MMV program, it is critical that the technologies selected meet future operating requirements including regulatory requirements and stakeholder expectations. •Seafloor and water column conditions. These networks will be deployed through the GipNet Program. The purpose of the Program is to validate thresholds for detection in the local environment, i.e. the nearshore shallow marine area in which CarbonNet's storage sites are located. This area is similar in many respects to other prospective storage basins globally. If successful the technologies could be used to undertake pre-injection baseline measurements and may form a component of the MMV program for the CarbonNet Project. The report details a five-year program, including the proposed technologies to be used and outlines the advantages and limitations of each technology. Importantly, the report describes the potential for the technology to determine whether stored CO2 is behaving as expected; this is a critical requirement for stakeholder assurance. The Global CCS Institute is supporting the development of the CarbonNet Project through a series of reports and enable the sharing of knowledge throughout its development. The CarbonNet Project, located in the Victoria, Australia is in its feasibility phase. It is planning the development of a hub-based network that will centre on a large capacity pipeline (up to 5 million tonnes per annum) to deep, secure storage sites in the offshore Gippsland Basin. A critical aspect of hub-based network projects in general is the complex process of gathering multiple sources of CO2 (e.g. coal-fired power stations, natural gas processing, etc. ), each with unique properties, into a single pipeline and into a storage site. This report explores the details of different specifications from the various potential capture methods and feedstock, which could come together and how that could impact the specifications of infrastructure and the storage site itself. The report outlines the lower and upper bounds of the potential CO2 specifications a hub project could encounter and proposes technically achievable limitations on the whole of project chain. This includes source proponents’ requirement, pipeline integrity and composition, requirements of the storage site, as well as health, safety and environment factors. Finally, the report outlines the techno-economic trade-off between additional processing for the CO2 sources and the impact on transport and storage. By undertaking these studies in the early phase of project development, barriers such as restrictive specifications can be minimised and this could reduce costs overall, whilst increasing the viability of the multi-user system- the key platform for any hub-based network project. This report is a product of work undertaken by Parsons Brinckerhoff with inputs from the CarbonNet Project team. 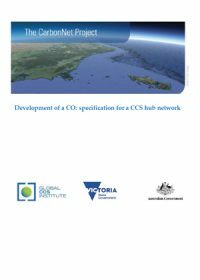 The Global CCS Institute presents the sixth report published by the CarbonNet Project, located in Victoria, Australia, this report has focussed on a critical aspect of CO2 storage - containment of the CO2. CarbonNet are investigating the potential for establishing a large scale, multi user CCS network bringing together multiple CO2 capture projects, transporting CO2 via a shared pipeline and injecting it deep into an underground, offshore storage site and is currently in feasibility and commercial definition stage. The Gippsland Basin is known to have a world-class proven regional seal (or caprocks), known as the Lakes Entrance Formation it has stored oil and gas accumulations for tens of millions of years. This regional seal has always been identified as the final barrier to CO2 plume migration in any storage concept in the basin. This report has identified several additional, laterally extensive seals below the regional seal, known as the T2 seal. These additional sealing units are expected to provide an effective barrier to the CO2 injected into the primary storage targets below in the Halibut reservoirs. The T2 seals are proven to be effective containment rocks as they have previously retained oil and gas accumulations locally and nearby. Also, lab measurements on rock samples of the seal suggest they could hold back a column of CO2 in excess of what is expected to be required in the reservoirs below. 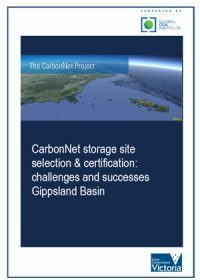 This investigation has revealed there may be hundreds of gigatonnes of additional storage available and confirms that the Gippsland Basin is a world class storage site for CCS. 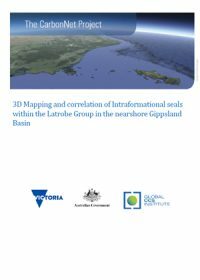 This report is authored by N. Hoffman , T. Evans, N. Arian, The CarbonNet Project, Melbourne, Australia; Guy Holdgate, University of Melbourne. Chris Consoli, Institute Senior Adviser for Storage, Asia-Pacific also provides an overview of the report in an Insight available on the Global CCS Institute website. 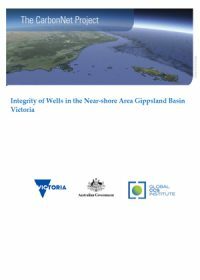 The Global CCS Institute presents this new report by CarbonNet evaluating the impact legacy petroleum wells may have on their search for CO2 storage sites in the nearshore Gippsland Basin. The CarbonNet Project is investigating the potential to establish a CCS Hub bringing together multiple CO2 capture projects in Victoria’s Latrobe Valley, transporting CO2 via a shared pipeline and injecting it into deep saline formations in the nearshore Gippsland Basin. This report identified and then analysed legacy petroleum wells that may have an impact on the feasibility of CO2 storage sites targeted as future storage concepts. The analysis included using data lodged with the regulatory authority to assess how the legacy petroleum wells were ‘completed’. The investigation found that none of the wells have any significant risk of leakage and that there is negligible risk of CO2 rising to near-surface levels. This report is authored by Todd Goebel, Nick Hoffman, Barry Nicholson, and The CarbonNet Project. Chris Consoli, Institute Senior Adviser for Storage, Asia-Pacific also provides an overview of the report in a new Insight available on the Global CCS Institute website. 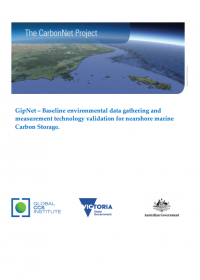 The Global CCS Institute presents the second report by CarbonNet to identify and then characterise suitable storage sites in the offshore Gippsland Basin. The CarbonNet Project is investigating the potential to establish a CCS Hub bringing together multiple CO2 capture projects in Victoria’s Latrobe Valley, transporting CO2 via a shared pipeline and injecting it into the offshore Gippsland Basin. This report details the history of the site selection process between 2010 and 2015. The search for a storage site has followed international best practice, aligned to DNV GL Recommended Practice (DNV-RP-J203) to provide decision makers and stakeholders with independent expert assurance of environmentally safe, long-term geological storage. This report is authored by George Carman, Nick Hoffman, and the CarbonNet Project. Chris Consoli, Institute Senior Adviser for Storage, Asia-Pacific also provides an overview of the report in an Insight available on the Global CCS Institute website. The Global CCS Institute presents a carbon dioxide (CO2) storage site characterisation study for the CarbonNet Project. The CarbonNet project is investigating the potential to establish a CCS Hub bringing together multiple CO2 capture projects in Victoria’s Latrobe Valley, transporting CO2 via a shared pipeline and injecting it into the offshore Gippsland Basin. The report details the steps taken during the screening of potential storage sites in the offshore Gippsland Basin. Three of the highest ranked sites are identified and their geological characteristics detailed and suitability for CO2 storage are described. The report found that all three storage sites are located nearshore and have the potential to dispose of between 25 and 15 Mt of CO2 permanently in deep saline formations. This report is authored by Nick Hoffman, George Carman, Mohammad Bagheri, Todd Goebel; and the CarbonNet Project for the Global CCS Institute. Chris Consoli, Institute Senior Adviser for Storage, Asia-Pacific also provides an overview of the report in a new Insight available on the Global CCS Institute website. 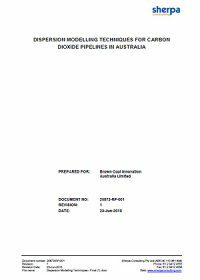 Victoria’s Department of Economic Development, Jobs, Transport and Resources prepared this Knowledge Sharing Report for the Global Carbon Capture and Storage Institute. 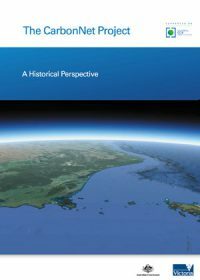 This report provides a historical perspective of CarbonNet from prior to its inception to now. It is intended to help project participants and their stakeholders understand how the vision of a network hub concept has developed in Victoria, Australia. 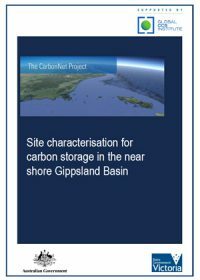 Victoria’s Department of Economic Development, Jobs, Transport and Resources prepared this Knowledge Sharing Report for the Global Carbon Capture and Storage Institute. 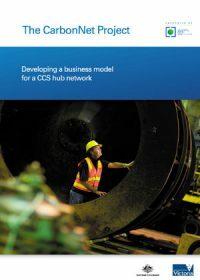 This report defines a generic Carbon Capture and Storage (CCS) hub project, and outlines the commercial framework developed to support analysis of roles and responsibilities between the public and private sector in developing a CCS hub project.